This week I’ve been attending the Distinguished Lecture Series at Cardiff University where I heard Professor Robin Dunbar (yes, he of Dunbar’s number) talk about some incredibly interesting topics. I aim to post a few things about the whole lecture series, but for the minute here is what’s grabbing me, the importance of laughter and humour in human relationships. I’ve been struggling with this for a while after someone suggested to me that humour in the workplace was about ‘hiding from the truth’, ’not dealing with difficult things’ and ‘not confronting our buried emotions’. Blimey, that’s all a bit distressing and depressing. As I’ve always tried to have as much fun as I can in work, using humour and laughter, I must really be suppressing something huge! Laughter turns strangers into friends (sounds like a strap line for some Christmas drink advert, but it makes a lot of sense to me). I’m not doing credit here to what Professor Dunbar said and I would encourage you to watch the video. What this has done however is given me the chance to relive one of my most epic failures, where an attempt to introduce humour into the workplace almost cost me a friend. My friend was having a great deal of trouble trying to get their superiors to make a decision. The process involved countless iterations of a business case, double and triple checking, risk assessments, procurement policy checks and meetings to go over and over the same ground. You may be familiar with this, or have heard about a similar type of situation, its shocking, I know. Like all good friends I listened to their troubles over several weeks and tried to offer comfort and advice where I could. As it happens about this time I was on holidays in the US where I saw this ‘Make a Decision’ note pad and my friends predicament came straight to mind. Perfect I think, a bit of humour is just the thing to get things moving. 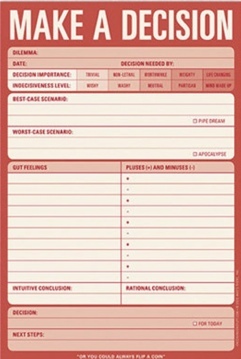 Make a Decision notepad. I laughed! It sank like a lead balloon. The boxes to fill in on the ‘Make a Decision’ form were leapt upon with greedy enthusiasm, but when it got down to the detail there were totally bemused responses. “what do they mean by ‘apocalypse’ for worse case scenario? Do we have a corporate definition of apocalypse?”. This might of course have been an elaborate double bluff, but I don’t think so. Some rapid diversion tactics were required and refocusing onto some familiar territory like, ‘updating the risk register’. Perfect, order restored. In our post project learning (over beer) my friend and I discussed where it had all gone wrong. Definitely the delivery method could have been better (they say comedy is all about the timing), but for this audience a blatant attempt at humour was probably just too alien. 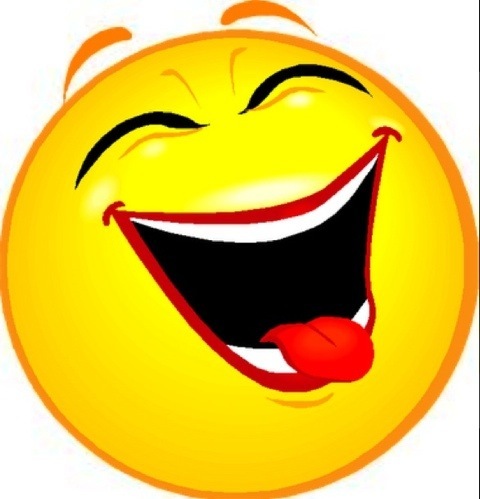 Humour and laughter are useful but you need to consider the audience. For some groups and settings it’s just too alien. Getting the delivery and timing right is important. Tabling the ‘Make a Decision’ form enthusiastically at a project update meeting was not the best option. Put yourself in their shoes. This was probably seen as highly threatening to the group rather than something humorous. A real shame.